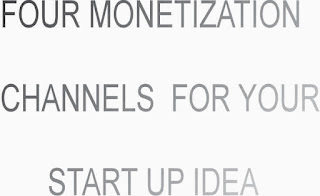 Having a monetization channel for your product is very important in the early day thus it allows you to examine channels is suitable for your idea and which is no., Don't worry today am going to explain four monetization channels you can select and implement for your new start up idea, although each of this channels comes with it own challenges. This channels comprises of free and premium module, the free is for low end users and the premium is for power users who can afford to pay for your product, usually everyone is set on the default free module when they register for the product, which has some limited features and along the way premium module is advertise to them that has the full features of the product and other added benefits, technology start ups like Spinlet, olx and jiji all implement this channels. channels include Facebook, twitter, Techcabal, and not forgetting this blog. This channel normally works with start up whose product usually go around for regular update, by subscribing you get the full access to the additional update and pitch that further enhance the performance of the product. Nice one, They must be an alternative in monetization..